The Strong, Empowered, & Classy Project highlights the people that know how to surpass boundaries and live happily despite life’s major woes. 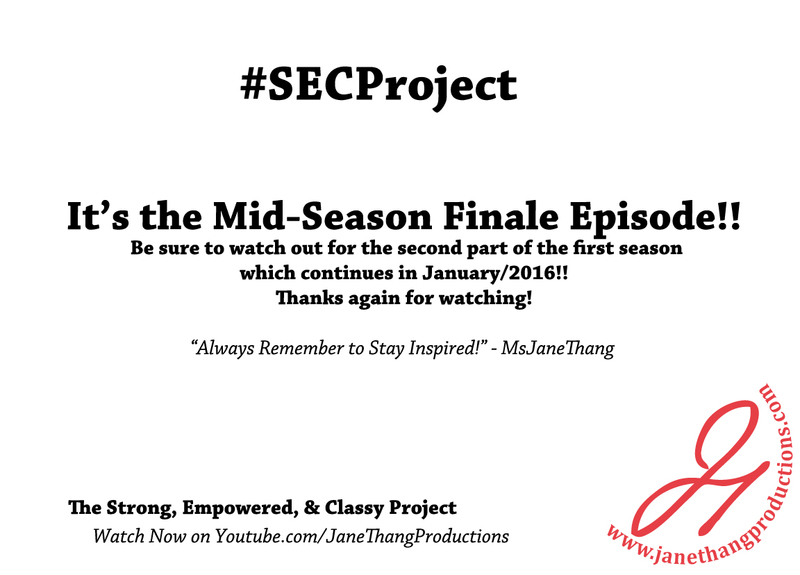 In this mid-season finale episode, Kristen Hayman (@MsJaneThang) asks a few journalist to drop some inspiration for the viewers of the #SECProject docu-series during the 2015 NABJ conference in Minneapolis, Minnesota. This is a raw, off the cuff episode so we hope you can endure the sound quality and catch the inspirational gems! Be sure to watch out for the second part of this season which continues in January/2016!! Thanks again for watching! Thank you for visiting www.janethangproductions.com. Be on the look out for more sources of inspiration from the Strong, Empowered, & Classy Project, starting back up in January/2016 We are truly thankful for everyone’s participation in sharing their powerful perspectives with us. We hope you enjoy their stories as much as we love to showcase them! If you do, please don’t forget to share them with your family and friends!